Walking the painful path of divorce can leave us feeling isolated, discouraged, and wondering whether we will ever feel happiness and peace again. 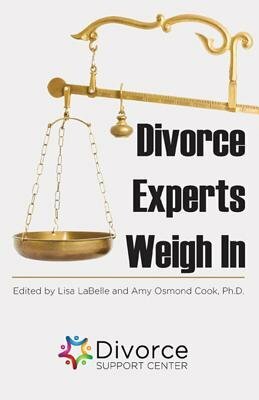 In this informative and inspiring collection of essays, divorce professionals from therapists to attorneys share their expertise on how individuals may best navigate the difficult terrain. Therapists, wealth managers, attorneys, forensic accountants, and business professionals share their best advice on how to find hope and happiness following divorce. Amy Osmond Cook, Ph.D., is the executive director of Divorce Support Center (divorcesupportcenter.com), a resource site and nonprofit dedicated to helping individuals find hope during and after divorce. She is a faculty associate at Arizona State University, where she teaches writing and communication classes. Lisa LaBelle is the co-executive director of HopeAfterDivorce.org, a resource site and nonprofit dedicated to helping individuals find hope during and after divorce. She is also a weekly contributing writer for LA Family Magazine. Lisa holds a BS degree in education and is working towards her Master's degree in counseling.